Before the great bottoms and Delta lands of Mississippi, Arkansas, and Louisiana were drained and cleared in the 19th and early 20th centuries, they were covered with forests like nothing we can imagine today. “In stature, in towering majesty," those woods were "unsurpassed by any trees of our eastern forests,” observed Theodore Roosevelt, after hunting in the Delta woods of Mississippi and Louisiana in the first decade of the last century. Other writers were more specific: “Many lofty oaks measured . . . five feet in diameter” and were “60 to 70 feet to the first limb,” reported a Jackson, Mississippi, newspaper in 1890. James Gordon of Pontotoc County, Mississippi, wrote of Delta sycamores and cottonwoods ten feet in diameter. One yellow poplar tree cut around 1890 in Holmes County, Mississippi, measured twelve feet through the middle! 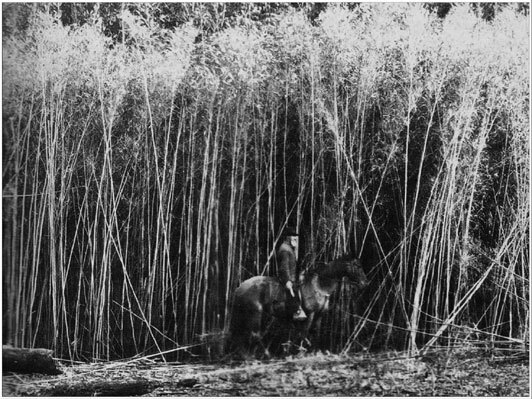 Expansive stands of bamboo-like cane (Arundinaria gigantea) formed a singular feature of that virginal wilderness. Often called blue cane, the plant, which did not tolerate inundation well, grew on the better drained, higher rises. A member of the grass family, cane thrived only where it received plenty of light. As a result, it proliferated in dense stands in clearings in the forests where trees had been removed or felled by fire or tornadoes or otherwise. Composed of individual stalks commonly more than 20 feet high, sometimes as big around as a man’s wrist, and spaced hardly more than an inch or two apart, these cane thickets, called “brakes,” often grew in patches covering several square miles of the Delta. An integral component of the bottomland ecology, the canebrake served as habitat for creatures as diverse as the Bachman’s warbler and the black bear and the swamp rabbit and the panther. Game was so abundant, in fact, that, beginning in the early 1800s, hunters from around the country and even from England and Europe journeyed to the Mississippi River bottomlands to hunt deer and panther and, especially, black bear. The Delta country was a bear hunting ground like no other. Bears were so numerous that Coahoma County, Mississippi, bear hunter Robert Eager Bobo killed as many as 304 in one year -- while also finding the time to take "54 deer, 47 wildcats, and 9 panthers"* during that same twelve month period! Because the cane grew on the higher, dryer, ground, the settlers who began to trickle into the bottoms after the War Between the States looked for canebrakes to clear to develop some of the first plantations on the fertile soils deposited by the periodic overflows of the Mississippi and its tributaries. When the advent of the levee system and the railroads in the 1890s lessened the threat of flooding and guaranteed convenient transportation, the trickle of settlers became a deluge, and the days of the Delta Wilderness were numbered. The canebrakes went first and now, probably none exist. By 1942, William Faulkner would write in his fine story, "Delta Autumn," that the great swamp had been "deswamped and denuded and derivered in two generations." He might have added, "de-beared and de-panthered," as well. Canebrake Publishing Company seeks to bring to the modern reader a taste of that former time, when the cane grew, as Memphis legend Nash Buckingham put it, "moon-high and molasses-thick," panthers stalked deer through the thickets, and bears still roamed in uncountable numbers beneath the lofty Delta timber. While our primary means of recalling that fabled past will be books, the first of which, The Bear Hunter: The Life and Times of Robert Eager Bobo in the Canebrakes of the Old South, was published in 2015, we also will be offering a blog as well as a virtual archive consisting of links to online and other historical resources pertaining to the historical outdoor South. More books are in the works, as well. Through books and this website, we hope to promote interest in the fascinating history of hunting, fishing, camping, and the outdoors in the lower Mississippi Valley, encourage research concerning the same, and cement into our cultural memory many of the great men and women who made our region what it is and who deserve to be remembered (be sure to visit our Hall of Fame). Come explore with us a place that now exists only on the pages of history -- the wild, trackless Delta Canebrake. *Please note: We do not approve of such killing of game but repeat these numbers in order to attempt to convey to readers the incredible wildlife riches of the old Delta.